I had just returned from Dehradun a few weeks back to find the atmosphere in Mumbai’s birding circles electric. Much of this was coming from that amazing sighting in Vasai, the red-breasted merganser, the first authentic record of this species in India. Almost every birder spread out over our metropolis (as well as people from Bengaluru, Kolkata, and several other locations) had made a beeline for this bird and it had been a very cooperative subject giving good views to all who visited including participants of the Mumbai Birdwatchers’ Club (MBC) walk the week before. To keep the momentum going, we decided to hold another bird walk on the very first day of 2017. The location initially was the Bhandup Pumping Station (BPS). There was some excitement there about a week before this planned walk when a solitary Common Shelduck was spotted and photographed there. This might be only the 2nd record of this species (pending confirmation) from the Mumbai region. However, the bird was not seen later, even by those visiting the same day. In any case, BPS is always a happy ‘birding’ ground and with the likes of Adesh Shivkar leading the walk, any bird enthusiast would be in for a fantastic experience. And then, just 2 days before the walk, Mayuresh Khatavkar, another well-known birder gave the big news. The common shelduck was seen again, but this time in Uran. A flurry of activity, and the destination of the walk was instantly changed, to give every birder a chance to see this rarity. Kuldeep and I would be assisting in the co-ordination of the walk, so we headed to the meeting point early along with two more participants of the walk, Ronit Dutta and Mita Gala. Shortly, we reached the Jasai wetlands, also the meeting point on one of the earlier MBC birdwalks. This time though, they were flooded with the high tide still receding, so while waiting for the other participants to arrive, we birded from the road itself. The flamingoes were not there this time around, but many of the waders we had seen the last time around were, including black-tailed godwits, little stints, painted storks, common greenshank, marsh sandpipers among a few others. As a few of the participants arrived, almost as if to compensate for the flamingoes, we noticed a very large congregation of pied avocets in the distance. In the early morning mist, their numbers had not been apparent, but together with the local fisherman working in the area and a lone Eurasian marsh harrier doing sorties, the flock often took flight, numbering nearly 150 by our estimate. Adesh arrived as well, and with a few more participants coming in, approximately 30 of us were treated to these pied avocets flying across the rising sun. After everyone had a good look at most of the species present, we decided to move on to Panje. As always, we drove slow keeping an eye for various species. We saw some of the usual suspects, Asian openbill stork, glossy ibis, white-eared bulbul, Siberian stonechat as well as a few other species. Then as I was driving, a raptor flew across the road just a few feet ahead of our vehicle. A medium-sized body, long tail, small rounded head, and we realized we were dealing with another harrier. But with its pale grey body, whitish underparts and dark primaries, we realized this may not be the ubiquitous Eurasian marsh harrier. We instantly got down from the car, but it had made its way deeper into the grassland. Our initial impression was a Montagu’s or Pallid harrier male (the Hen harrier is not as common to the region, though also a possibility) but we were unable to conclude the ID. Ronit had brought along a scope as well so Kuldeep along with a few other participants had decided to try their luck in getting a sight of the common shelduck. As I caught up with them, they were smiling and I knew they had gotten their prize. It was well outside the usual binocular range, so I had a look through Ronit’s scope as well, my excitement barely contained to have a look at this potential lifer. Only to find it wasn’t there! Much to the chuckling of Ronit and Kuldeep, I threatened that I wouldn’t allow the common shelduck as part of our eBird list until I had a decent look at it 😀 Ronit was good enough to understand my desire to see this bird, so a few minor adjustments later, he said he had the bird back in sight of the scope. With some trepidation, I looked again. The scope was trained at a grass mound in the middle of the wetlands, and I couldn’t see much initially, but then I noticed some white behind the grass. And then a prominent pink bill. Slowly, this beauty of a lifer came into view. Adesh and the rest of the participants had now caught up with us as well. After getting a quick idea of where Ronit had his scope pointed, within seconds, the bird was within the sight of Adesh’s scope as well. One by one, each of the participants had a look at the bird. Adesh once again pointed out the specific characteristics of the bird, including the upward curvature of the tip of the bill, something which wasn’t obvious even in illustrated plates of the bird in the guide book. We weren’t sure at this point of time about the records of this species in Mumbai. But noted naturalist and birdwatcher, Sunjoy Monga has pointed out to at least one prior record of a small flock of common shelducks at the Tulsi lake in the Sanjay Gandhi National Park sighted by Charles McCann (the exact year is not very clear, possibly 1916 or 1917). In any case, the bird is definitely a rarity for the region. This turned out to be a very gracious bird too as while we were watching it, it decided to do a fly-by moving to the wetlands on the other side of the road giving some participants a fantastic view and giving the eagle-eyed photographers a chance to get a shot of it in flight which also let us know conclusively that bird is a female going by the less prominent breast band and lacking the knob on the bill seen in the male. With more sightings of different species such as the Caspian tern, grey heron, garganey, northern pintail, northern shoveler and even the ruddy shelduck, we were thoroughly sated as a group. A few of us who had also decided to give a quick try in the drier areas of Panje for the Caspian plover got two additional bonuses. One was the common shelduck giving us another fly-by back towards the original wetlands we saw in the morning (The few of us are indebted to one of the participants, Chirag Ahuja, as he first saw the bird take flight from a distance). The second bonus (no, we didn’t see the Caspian plover unfortunately) was another skulker, the slaty-breasted rail at rest near a reed patch close to some houses. This again was thanks to the dedication of a few of the participants such as Nayana Amin, Roozbeh Gazdar and a few others who were determined to check this small area. As we headed back to our vehicles, we were informed some members of the group who were birding near the road including Kuldeep and Ronit had been treated to the grand, relaxed flight of a Peregrine falcon! And even after we left the place, we were treated to sights of more raptors on the road, the common kestrel, pallid harrier (this time it flew right over our heads, perhaps the same bird from the morning who had decided to be generous with us), oriental honey buzzard as well as the Indian spotted eagle close to the Jasai stop we had made in the morning. Guide to the location can be viewed in the previous blog to the same location. It was during an eBird monitoring workshop conducted at the Mahim Nature Park in September that I first heard whispers. The Mumbai Birdwatchers’ Club (MBC) was being revived. Having only started birding in the last couple of years, I was not even aware such a platform had even existed. There were of course communities of birders spread out over the expanse of Mumbai, Thane, Vasai, Dombivli and Navi Mumbai out almost every weekend (if not during the weekdays too), but an initiative that would seek to unite all of us that followed these winged beauties throughout the year (Yep, even during the monsoon) made for an exciting prospect. Like any other social activity, birdwatching is also best enjoyed in a group, like-minded people using the combined power of their observation skills to maximize sightings of both species and interesting behavior and also sharing their collective knowledge gained by experience. An initiative aimed at aiding conservation of habitats under increasing human pressure, no fees would be charged for any of the walks, the purpose being to build a community of bird lovers who could consistently document avifauna by putting their checklists on sites such as eBird along with photographs. So, it was great to finally hear of the first birdwalk being planned on the 30th of October, a Sunday at one of Mumbai’s most popular birding hotspots, Bhandup Pumping Station (BPS). The area is part of and synonymous with the recently established ‘Thane Creek Flamingo Sanctuary’ declared in August last year which itself is spread out over 1,690 hectares. It has been recognized as an Important Bird Area (IBA) by the Bombay Natural History Society, an initiative by Birdlife International to identify global avian diversity hotspots. 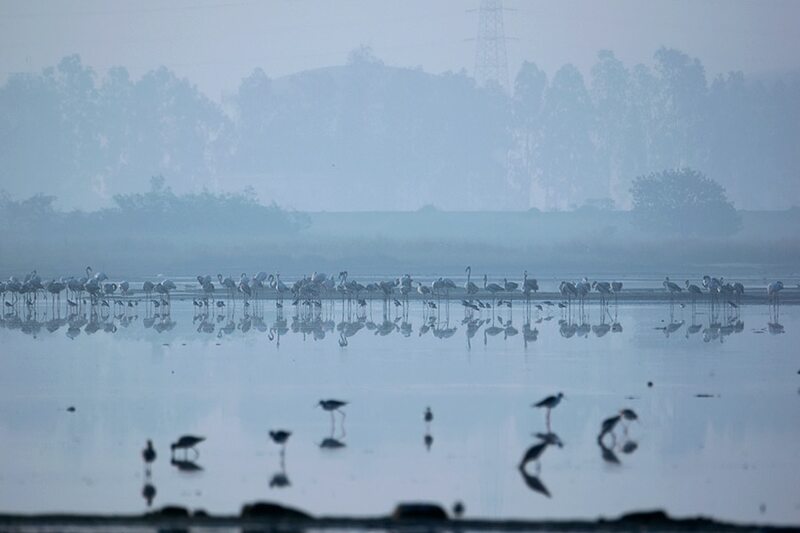 As its name suggests, BPS like its south Mumbai counterpart, Sewri serves as a congregation point for the famous flamingoes, including both the Greater and Lesser flamingoes. They can actually be sighted throughout the year, but the highest numbers are typically seen from November onwards going into the summer months. In addition to the flamingoes, BPS also supports an incredible avian diversity with more than 200 species reported from the area, including rarities for the Mumbai region such as the Pallid Scops Owl and Grasshopper Warbler. The co-ordinators for the first birdwalk were Saurabh Sawant, Amey Ketkar and Rujuta Phadke, all respected senior birdwatchers that have spent many years documenting avifauna all over Mumbai, and over the rest of the country as well. We were meeting at 7:00 am, and I had decided to drive there, so I picked up fellow birders, Vikrant Chaurasiya and Yogesh Patel as well as Saurabh as we headed to the meeting point just near the entry point to BPS close to Airoli bridge near the salt pans. While mail registrations had been sought, there were still a good deal of informal confirmations of arrival so it was unclear what the participation was going to be like. We reached the spot, meeting Amey and Rujuta as well at 6:45 AM, while waiting for others. By 7, a total of 25 people had gathered together, an ideal size that Saurabh, Amey and Rujuta were looking at for the group. We then decided to make our way in. Finally, all of us reached the designated spot in BPS which is a tarred road with the Pumping Station on the right and the creek on the left. We also met with another senior birdwatcher who had already reached the spot, Mayuresh Khatavkar who was already actively birding pointing us to a large congregation of blue-cheeked and blue-tailed bee-eaters. Without as much as a second thought, everyone had their binoculars and cameras out, and the avian treasures of BPS revealed themselves. A Yellow-eyed babbler skulking in the long grass, Baya weaver flocks foraging away along with Red Avadavats as well. Interestingly, hidden in the long grass, we spotted some migratory buntings as well. We got a second look at them later in the day too, however from the angles visible, were unable to see the characters favouring a particular species, photographs were taken, and it was best narrowed down to an immature red-headed/black-headed bunting. Amey had brought along the scope as well, so we made our way along the dirt trail taking us further inside the creek. We could spot grey-throated martins (plain martins) flying overhead. Gradually, as we went closer, we could see huge flocks of waterfowl (ducks among which northern pintails seemed to be the most numerous), egrets, gulls, terns and black-winged stilts on our right. The air was abuzz with the calls of warblers as well. Amey put up the scope and one by one, we had close looks at different species such as the slender-billed gull, grey heron, little grebe among others. There was also some activity further up ahead. Some of our fellow birders could see warblers. Saurabh was with the group, and to everyone’s delight, they were treated to close views of both the paddyfield and Blyth’s reed warbler. It was a great opportunity to compare the characters that separated the two species. As we made our way back, on the opposite side which were dotted with mangroves, the group spotted more new species for their list on the day. A common snipe was feeding sheltered in the mangroves, and three different species of sandpiper, common, wood and green sandpipers were also seen. Once again, Amey, Saurabh and Rujuta guided the group on the different characters that separated each species, from the prominent supercilium (eyebrow) of the wood sandpiper to the white shoulder patch of the common sandpiper. We made our way back on the tar road and decided to explore the road up till the end. White-eared bulbuls were almost continuously seen every few metres. A spotted dove stood watch perched in the high branches. And then the delight of most birders was seen, the Indian Paradise Flycatcher. Almost everyone caught a glimpse of the bird, though photographing it was a challenge as it moved in the canopy. As we headed further, we also spotted a house crow mobbing a western marsh harrier. Mobbing is an anti-predator mechanism where one or more birds dive-bomb, attack,harass a bird of prey such as this Western Marsh Harrier. The purposes could range from defending young to stealing food. It had already been an incredibly rewarding walk, when I got a call from Vikrant at around 9:15 AM. Two more our company, Varun Satose and Aditya Akerkar were planning to head to Uran to catch a sight of the Caspian Plover, a very rare migrant which has only a few records from India, and had the birding circuit abuzz during the week. I had already been planning a visit, and I latched on to the opportunity as Vikrant had been to the spot the previous day. I took leave of the group, and we were also joined by another enthusiastic birder, Arun Varghese. Long story short, we reached Uran by 10:30 AM and began our search for this elusive plover which has only a few records from India. It had been seen in the dried lake bed at Panje village. We soon came across the first of plovers, which were little ringed plovers in varying states of plumage. Further on, we saw Kentish plovers as well. Vikrant had seen the Caspian plover very close to the road the previous day, and the plover didn’t seem to be in the same area today. We went further in, and were also joined by some birders from our birdwalk including Mohak Katvi, Vinod Verma and Prathamesh Desai. On their arrival, we were rewarded by an osprey flying high up in the skies. As we went further in search of the plover, Prathamesh spotted larks as well which turned out to be Sykes’s short-toed larks. Since we had missed on the plover, I decided to err on the side of the caution and didn’t get my hopes up high. We made our way to the location pointed out by Chirag and Nayana and soon spotted a huge flock of terns resting in the centre of a freshwater body about 70 feet away. We spotted Caspian terns, along with some smaller terns as well and not seeing the bird we expected to, again became concerned. Then, Mohak got an image on his phone from Chirag and we narrowed down the location based on the landmarks in the image. And then, we see something. Varun and I were closest to the spot, and almost simultaneously we spotted the much darker head and body. And then it turned. And there it was, in all its glory, the Indian Skimmer. Easily separable from the rest of the terns, the Indian skimmer’s bright red bill is adapted for a specific feeding strategy. It flies low over the water with the longer lower mandible of its bill ‘skimming’ the surface of the water which it snaps up as soon as a fish is caught. We took a few record shots and saw the bird in our binoculars to our heart’s content, delighted that our trip had in fact resulted in a rare sighting, even if it was not for the one we had intended. Being in a community of people who share the same passion could often result in unexpected rewards like these. My rendezvous with this Indian skimmer would never have been possible had I not joined the BPS birdwalk in the first place. As we shared the good news with some of our friends at BPS, Saurabh also informed us of the amazing morning they had there. A total of 83 species had been spotted, and the group was treated to some amazing activity by Eurasian wrynecks! Bhandup Pumping Station is accessed close to the intersection of the Eastern Express Highway and the Mulund Airoli road. If coming from Mumbai’s suburbs, one needs to take a u-turn under the Mulund flyover and then take a left. You will see salt pans on your left. Once you enter the road, keep following it until you reach the gate at the end manned by the forest department. Just before it, is a dirt track on your left. The condition of this road is questionable at best for the next 200-300 metres, and it is recommended to have a vehicle in good condition with high ground clearance, ideally an SUV before you once again hit the tar road further up ahead (Alternatively park your vehicle before the kachcha road). Birding is rewarding all along this road, and there is a trail opposite the pumping station which takes you further within the creek offering better viewing opportunities especially for waders and waterfowl. Close to high tide is the best time for viewing waders, but since there is a good mix of woodland and grassland habitat as well, even early mornings regardless of tide timings can be quite rewarding.